On the eve of publication of the Harper Collin's American edition of The Tragedy of the Templars I have been interviewed on the Knights Templar Vault website. Asked about the background to writing this new Templar book, I spoke of an account of travels in the East by Henry Maundrell called A Journey from Aleppo to Jerusalem at Easter, AD 1697. I was haunted by something written by the English traveller Henry Maundrell. Even four centuries after the fall of Acre in 1291, when the last Templars were driven from the coast of Outremer, the devastation wrought by the Mamelukes was still apparent. In 1697 Maundrell recorded the ‘many ruins of castles and houses, which testify that this country, however it be neglected at present, was once in the hands of a people that knew how to value it, and thought it worth the defending’. And you can follow the Knights Templar Vault on Facebook, which also carries the interview, by clicking here. Mick Jagger ... It's a Boy! 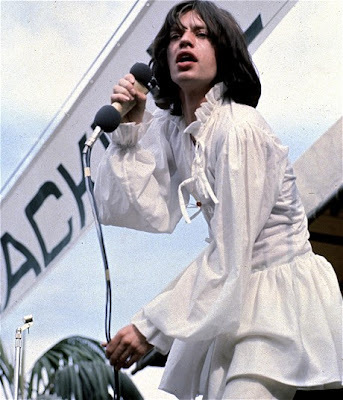 Mick Jagger, Hyde Park 1969, wearing what he called 'just another frock'. A long time ago the idea of writing Mick Jagger's biography was planted in my mind after meeting his mother Eva. 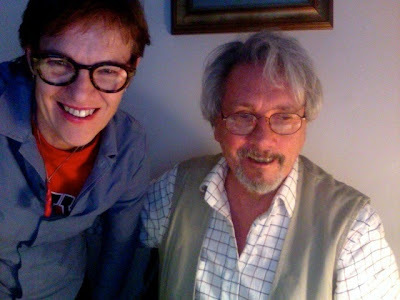 And now today, Jagger's birthday, the recollection returns. Seventy years old and strutting his stuff. The newspapers have been full of stories about him, including this one in The Telegraph which particularly caught my attention because it refers to Jagger's failed attempt at writing his autobiography. It seems that he cannot come up with anything interesting about his life; his one early attempt was returned by his publisher for being dull. He may be supreme on the stage, but he feels that he could have made more of his life: 'It’s slightly intellectually undemanding being a rock singer, but you make the best of it'. When I first introduced myself to Mick's mother, saying 'Hello, I'm Michael', Eva replied, 'Oh, I have a son called Michael'. And added crossly, 'But I do not like the name Michael'. Then Eva told me more. Her child was born during the war, in 1943, when many things were rationed, including food, clothing and home textiles, fuel and even soap. But Eva could claim for certain rationed things only when she gave the child a name. 'Because', Eva said, becoming crosser as her mind went back to the catastrophe, 'because he was a boy! I did not want a boy. I was expecting a girl. I had baby clothes for a girl. I had names for a girl. And all that was spoiled when the baby turned out to be a boy'. Isn't that how biographies work? 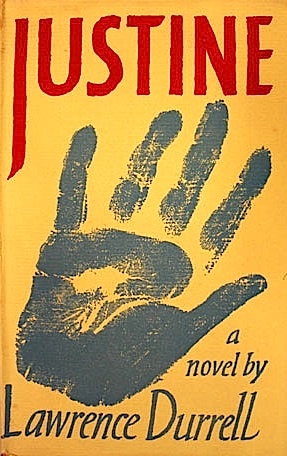 Lucette Lagnado, writing in The Wall Street Journal, considers Lawrence Durrell's Justine and the Alexandria he knew against recent political developments. Twenty years after he published Justine, the first novel of his Alexandria Quartet, Lawrence Durrell returned to the city of his obsession. The signs of decay were everywhere, but he fixated on one small but telling change: The colorful movie posters he had loved, showcasing films in numerous languages, were now exclusively in Arabic. Where was the multilingual, multicultural society he had chronicled so painstakingly and poetically? It was 1977, a quarter-century after the revolution in Egypt that toppled a king. After years of military rule, Alexandria's cosmopolitan culture was almost completely gone. 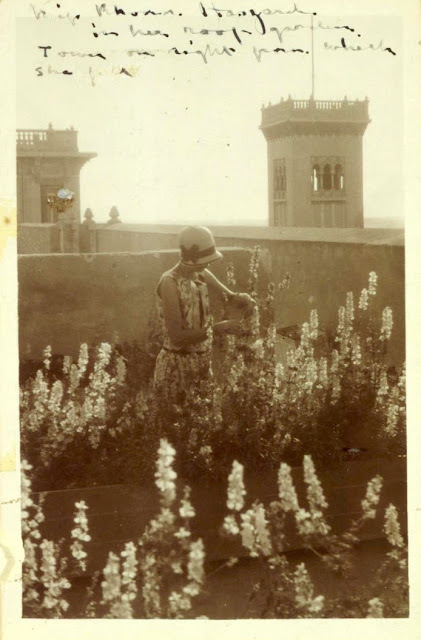 According to Durrell biographer Michael Haag in his book, Alexandria: City of Memory, the novelist found the city "listless," declared that it had sunk "into oblivion" and was depressing "beyond endurance." Were Durrell to return again now, he might despair even more. Two years after the Arab Spring precipitated another revolution, Egypt has seen a repressive Islamist government followed, again, by military rule. And just a few weeks ago, a young American Jew was murdered in Alexandria, which had once been a beacon for a mix of cultures, religions, outsiders and the young. So begins the article in The Wall Street Journal by Lucette Lagnado, author of The Man in the White Sharkskin Suit. To read the whole thing, click here. For more on Durrell's Alexandria and on Eve Durrell, who was a model for Justine, click here and here. Joanne Drayton has arrived from outer space. Well, from New Zealand, which is much the same thing. And it has fallen to me to introduce her to Earth as we know it, that is to Hampstead NW3. 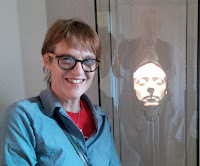 We have been to see George Orwell and John Constable and Johnny Keats - or rather the site of the bookshop where Orwell worked while writing Keep the Aspidistra Flying, the graveyard where Constable lies, and Keats' House where the poet's death mask floats eerily in the ether like the Mekon. Jo has written biographies of two world famous New Zealand crime writers, The Search for Anne Perry, and Ngaio Marsh: Her Life in Crime. She has also written a life of Rhona Haszard, the wonderful post-impressionist painter who mysteriously fell to her death from the tower at Victoria College in Alexandria, Egypt. In fact I got to know Jo when tracking down a photograph of Rhona Haszard that appeared in her book Rhona Haszard: An Experimental Expatriate New Zealand Artist, which I reproduced in my own Vintage Alexandria. To find out more about Joanne Drayton and her books, click here to see her website. Rhona Haszard watering flowers on the rooftop of Victoria College, Alexandria. She mysteriously fell to her death from the tower behind. 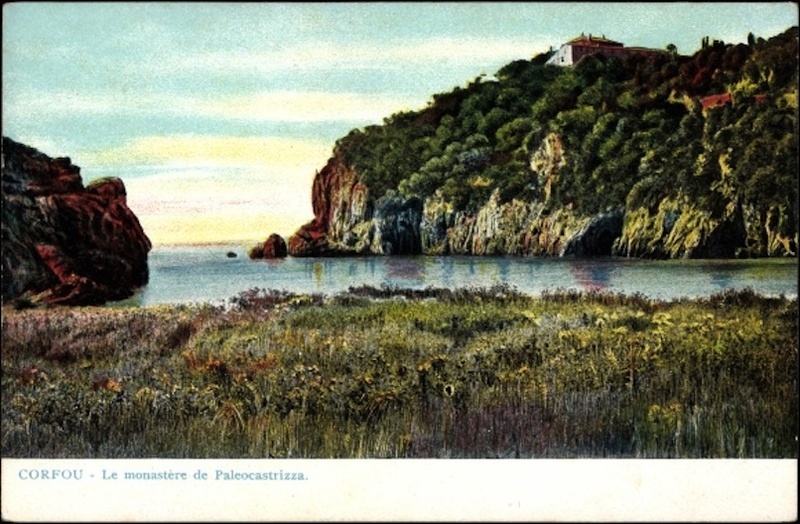 A vintage postcard of Paleocastrizza on the northwest coast of Corfu. 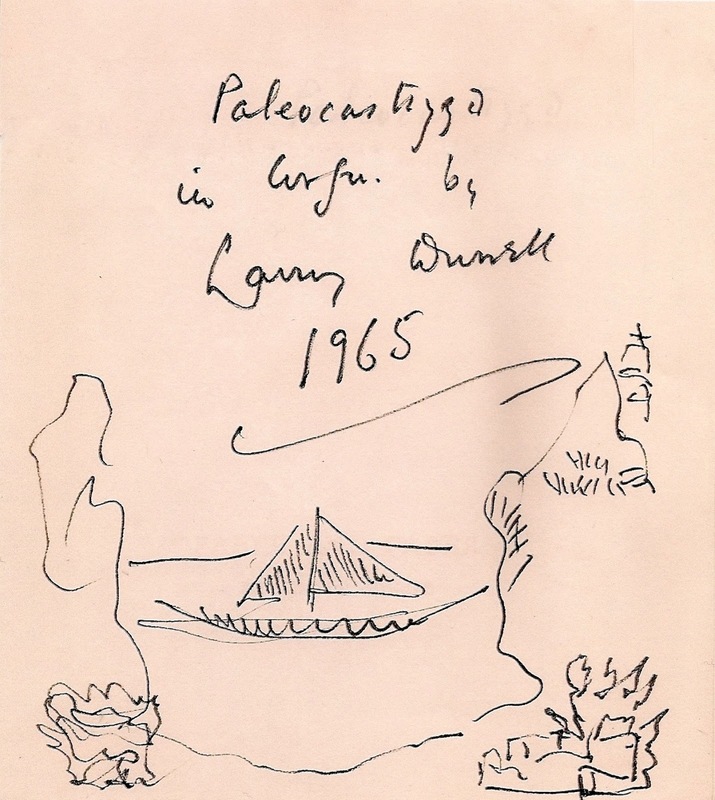 I have a drawing done by Lawrence Durrell of Paleocastrizza in Corfu. Today there would be beach umbrellas, tavernas and hotels in view, but my impression is that there was very little of all that when Durrell was on holiday there in 1965. The simplicity of his illustration compares to much older views of the place, like the vintage postcard above which dates from about 1910. Both capture the monastery sitting on the headland on the right. A boat sails through the centre of Durrell's drawing. It is more than a device for filling in the view and a way of suggesting the sea, the open waters of the Ionian, between the headlands. When Durrell lived in Corfu in the late 1930s he would sail to Paleocastrizza from his home at Kalami on the east coast of the island. The sailing boat is a memory of that pre-war idyll. Durrell also had the notion that Paleocastrizza was the very spot where Odysseus, shipwrecked, washed ashore and naked, encountered and impressed the beautiful Nausicaa, nor was Durrell slow to identify himself with Odysseus. 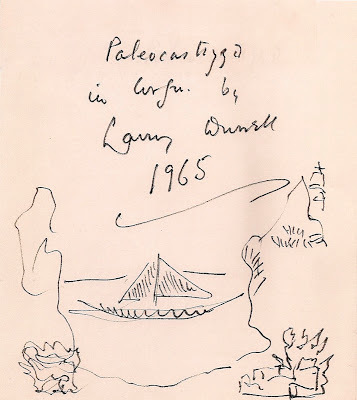 Lawrence Durrell's 1965 sketch of Paleocastrizza. 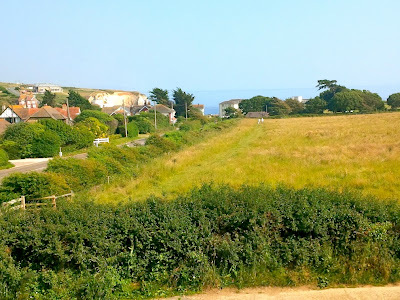 The path between Dimbola Lodge and Freshwater Bay. I took this photograph yesterday afternoon from an upper room of Dimbola Lodge in the Isle of Wight. A lane and a path run parallel to one another between the house and the sea. That path, seen clearly in the centre of this photograph, was followed in the 1860s and 1870s by Charles Darwin, Thomas Carlyle, Lewis Carroll, the poets Alfred Lord Tennyson and Robert Browning, the actress Ellen Terry, the painters G F Watts and William Holman Hunt and the astronomer Sir John Herschel. 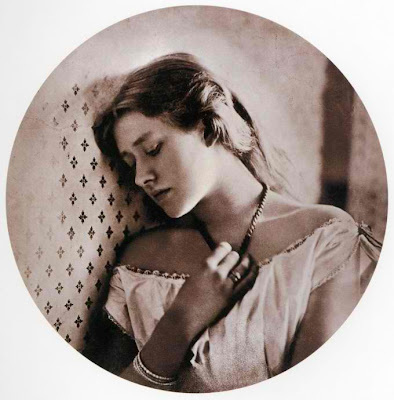 Each would call on Julia Margaret Cameron at Dimbola Lodge and be given a cup of tea - and be taken round to the back of the lodge, to a shed, where Julia kept her camera and related equipment. 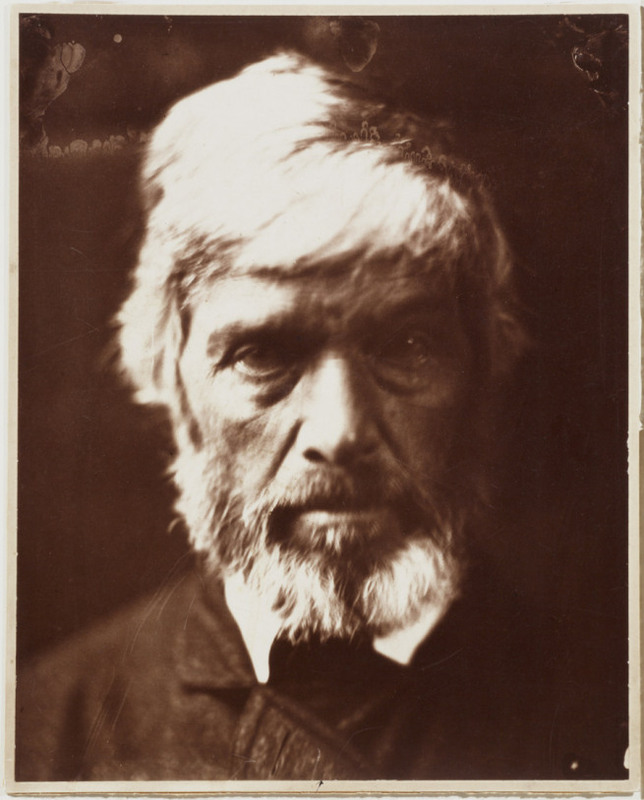 Julia's photographs, mostly taken on albumin and therefore possessing the finest detail, represent a remarkable collection of Victorian 'celebrities'. The story of Julia's life at Dimbola Lodge can be had by clicking here. 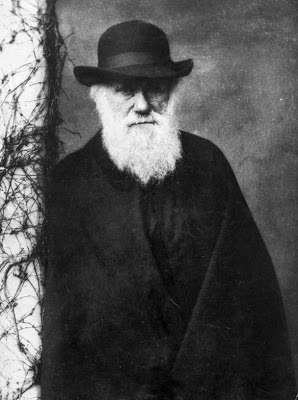 Julia's photograph of Charles Darwin at Dimbola Lodge. Thomas Carlyle photographed by Julia Margaret Cameron. 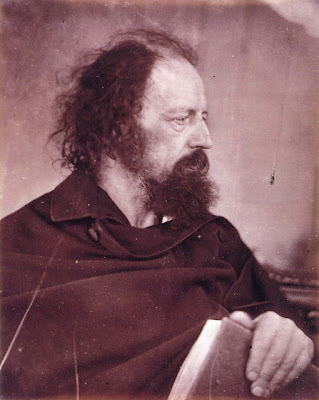 Alfred Lord Tennyson photographed by Julia Margaret Cameron.